Methinks I may be taking this photo posting too seriously. No, really. This isn’t any album display so I think I should stay away from posting too many pics. But this is so much easier than writing stuff out of my head. Most of it speaks for itself. A few online friends have written in to say that it’s a bad idea, NatGeo has a much better selection for those who like worms and insects. I do agree. But one has said that it’s a good idea. So guys, grin and bear it for now. I don’t plan to make it a habit, ok? Anyway, this sucker was huge. 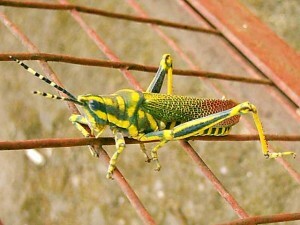 Almost six inches in length and bearing terrifyingly bright colors. The colors don’t look so bright in the photo but in real life they alone were menacing. Its hind thighs were almost the thickness of my little finger’s tip. For a minute I almost didn’t have the guts to go near enough to take a close-up. Call it bravado, but I did get close enough to shoot at least a few good snaps before it jumped off the mesh and flew into the blue sky. At one point, it turned directly at me and I thought it was planning to hop in my face. That photo didn’t come out very well since it shows only its face while the rest of it is out of focus. It also didn’t move around much except to turn a full circle where it sat. And that too at a leisurely pace. For a minute I thought that it moved slowly because of its size but then when I saw it hop and changed my mind very quickly. It jumped up more than a floor height before spreading its wings and taking flight. Very fast and without any apparent effort. We normally get small wheat brown grasshoppers here. Usually they are no more than an inch and a half. In the rains we get dark brown ones with red stomachs but they are also small. This one was an exception. I suppose these big ones belong in the grain fields but there are no fields here for many kilometers in any direction. This could have been just a scout sent out to find some foodstuffs. If so, I don’t think it found anything here. It came here one bright morning while I was watering the plants. The colors on its body were so vibrant that even as it hopped on to the mesh far to my left, I saw it out of the corner of my eyes. It sat around there for a good fifteen minutes before wandering off again. It was a surprise since we have many birds permanently settled in our mango and guava trees so the grasshoppers tend to stay away from our house lest they get invited to a meal where they are the main course. There are four wires to a foot in that mesh its sitting on so you can imagine the size. The mesh forms an enclosure for the dogs we had at one time but we haven’t gotten any new ones after both of them died of old age. We keep deciding to get another dog but keep postponing it till the girls are a little bigger and don’t need constant attention and supervision. These days we might have to wait till they are off to college before that happens… :).